Transform your bathroom, kitchen walls, countertops, and doors to a permanent display of light and color. Back painted glass is a modern, sleek and hygienic alternative to tiles and laminates. We use only the most innovative glass color coating nanotechnology to permanently back paint our glass. We use GlassKote USA™ paint along with stringent processing and handling to ensure quality. Back-painted glass creates a product that out lasts most architectural products such as tiles and laminates. It doesn’t allow mold or bacteria to form, it is water proof/resistant and it is very easy to clean since it is non porous. 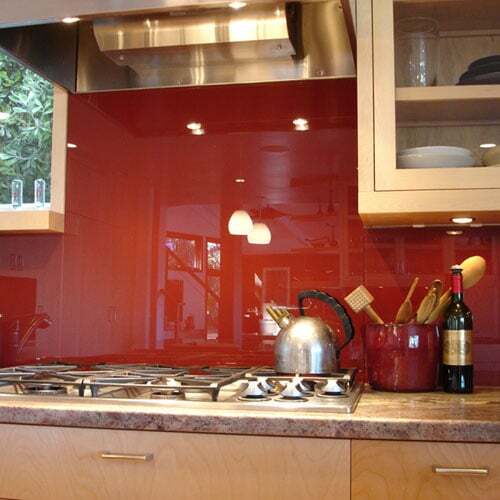 And since we have an endless color range, back painted glass can be used for a wide variety of applications. You can add various forms to your paint such as metallic flakes, faux finishes, design’s and more to created an even more unique glass appearance.